American General Media and 104.1 Pirate Radio is proud to announce it’s First Annual Thanksgiving Turkey Drive on Wednesday, November 14th from 7am-6pm! 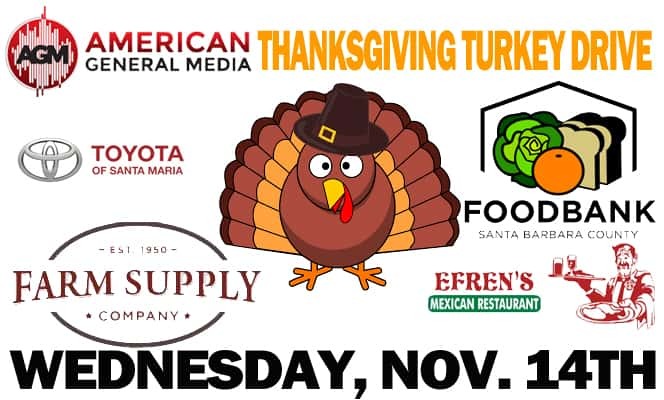 Turkeys, non-perishable food items, and cash donations will be accepted at the 104.1 Pirate Radio studio 2325 Skyway Dr. in Santa Maria to benefit the Santa Barbara County Food Bank. Stop by to make a donation and enjoy food from Pizzeria Bella Forno from 11am to 12pm, Efren’s Mexican Restaurant from 3pm to 6pm plus a chance to win prizes from Pirate Radio!